A balcony on the fourth story of an apartment building collapsed, killing six students and injuring seven. The 13 victims were standing on the balcony during a birthday celebration when it failed. According to investigators, the balcony’s support joists were completely broken off, approximately 16-20 inches from the building’s exterior wall. This caused the balcony to flip upside down and it slammed onto the balcony below. 13 people were thrown off when the balcony flipped and they fell 40 feet down to the pavement. 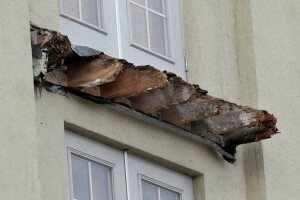 Building and Safety Inspectors say that the deck’s support joists had decayed to the point of severe dry rot. The balcony, made up of a concrete slab over hardboard, waterproof sheets and wooden joists, should have been able to support the weight of the students. However, they believe that a lack of ventilation inside the structure was possibly the cause of excess moisture which led to the dry rot. This apartment building was newly constructed in 2006. This case is already in court and the county’s district attorney is looking into filing manslaughter charges. Ladies and gentleman, dry rot is a serious problem and I’ve always said it is like a “cancer of wood”. Once it starts, it can spread rapidly and it will turn a solid wooden beam into a material that is as soft and weak as a “kitchen sponge”. If you have a problem with dry rot on your home or building, please don’t ignore it. You need to have it treated and replaced before it gets worse. When was the last time your home or building was inspected for termites and dryrot? If it has been more than a year, it is time to call us at (949) 631-7348.